Two Australian fishermen were astonished to come across a massive sea creature washed ashore near South Australia’s Murray River in the Coorong National Park. Steven Jones, the supervisor of a cockle fishing crew, and colleague Hunter Church spotted the creature over the weekend, and the National Parks of South Australia posted photos of the creature and its discoverers taken by Jones' partner, Linette Grzelak, on Tuesday. Grzelak told several news outlets that the fishers first thought they'd come across a hunk of driftwood. Though a huge animal, this particular sunfish, at about six feet (1.8 meters) long, is relatively small for its species. Jones, she said, knew of the creatures but had never seen one. "He said it was extremely heavy, and the skin was rough and leathery like a rhinoceros." "They can get a lot bigger… it's probably an average-sized one; they can get nearly twice as big as that," South Australian Museum fish collection manager Ralph Foster told the Australian Broadcasting Corporation. "I've actually had a good look at it, we get three species here, and this is actually the rarest one in South Australian waters," he said, noting that it is more common in other parts of the world. The sunfish, or Mola mola, are the heaviest of all the bony fish, and the largest among them can reach 14 feet tall, 10 feet wide and weigh nearly 5,000 pounds, according to National Geographic. They've earned their common name for their habit of basking near the ocean's surface. Though huge, they pose no threat to humans, and feed mostly on jellyfish. Mola mola are considered vulnerable, and populations are on the decline. They aren't often fished for. 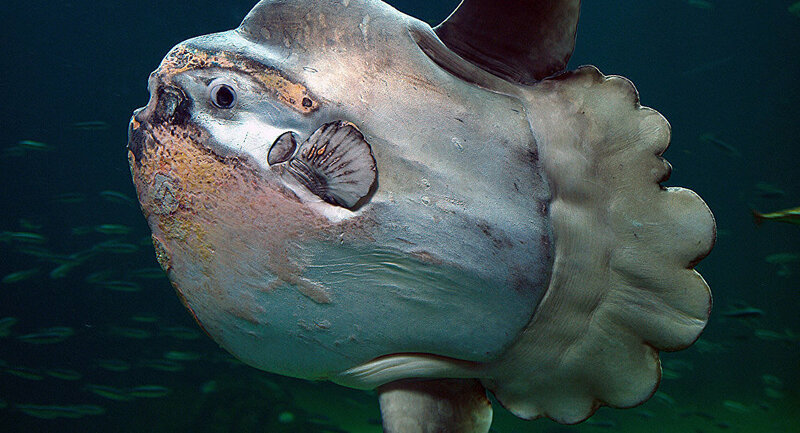 This specimen is the second sunfish to wash ashore this year — a rare hoodwinker sunfish was found at California's Coal Oil Point Natural Reserve in February, and it took scientists several days to positively identify the creature. That fish perplexed experts partly because it was so far from its known home waters in the Southern Hemisphere. Marine scientist Marianne Nyegaard, who identified the California fish, told ABC News she didn't know how or why this fish ended up on the West Coast of the US. "It is possible it just got lost, but it is also possible it is linked to climate change." "However, as we only so recently described the species, [we] don't yet fully understand its natural distribution and migrations, and much more research is needed to better understand what the sighting in California means." She hopes to begin tagging hoodwinker specimens to understand their movements in the ocean.